My 10 yr old and i read this series together. She gave eachbook a 4.5 and i gave each a 3.5...so we compromised on a 4. Rating3 stars.Book SeriesBook 3 of The Faerie Wars Chronicles series (5 books).My ThoughtsI had some serious mixed feelings about this book. On one hand, I enjoy the faerie world and Pyrgus's misadventures. There were some funny moments and good dialogue exchanges. On the other hand, the good characters were making bad choices for little to no reason, the bad characters were being unusually dumb, and aliens. Why aliens? There's faeries, humans, and demons. The aliens were too much.ConclusionI'm hoping this book is the dud of the series, and not a preview of what is to come. This book's structure was so weird. It spent HOW many pages building up the whole situation? Then it spent basically 10 pages (maybe even less?) wrapping it all up. The whole book was people going, "The Nighters did whaaa?!" "The Lighters did whaaa?!" "The demons did whaaa?!" "HUUUH?!" "OOOH I GET IT!" The End. It was odd. It almost felt like Brennan wanted to write this long well formed book... and then ran out of time at the end. Things wrapped up too fast. Not enough description, not enough dialogue, not enough character connections at the end. The first 7/8 of the book was fine and dandy... it's just the final 1/8th was too short. I feel like I just had this amazing climb up a mountain. Great scenery, and excited to get to the top to see what's there... then at the top there's the bottom again. Makes you go "...what?" Right? Yeah.. that's basically how I felt at the end of this book. I read this book last night. Yep, the whole thing last night. So...clearly it was a good story. The only repetitiveness is that the Fairies of the Night and the Demons from Hael keep showing up again to almost start a war. It's new a different each time. But, this one got a little bit weird. More swearing, albeit minor swears and some fictional land swears, lots more grown up thematic material, as in, about re-la-tions. And not your mother-in-law.I'm just not sure I would want my young adult reading this one. Don't get me wrong, there's nothing dirty. It just has some weird stuff.Also, I am confused by the character change in Pyrgus. Up until now he's been a pretty reliable kid. Maybe not wanting the weight of the kingdom on his back, but a good kid. Suddenly he's like the goofball that never could do right. You loose a bit of respect for him. Hopefully he'll gain it back. In the third book of the Faerie Wars series, Henry, Pyrgus, and Blue have to negotiate their ways through wars, deceptions, and work together again to save the Realm. Henry overthinks himself and starts to think that the faerie realm was all in his imagination, until demons intervene. Pyrgus gets to have some fun with the lighter military and gets into a mission that's more important than he initially thought. Blue as the queen the the faerie realm has lots of responsibilities and gets herself into a bit of a difficult situation that she in the end turns around to her favor in a devilish way. 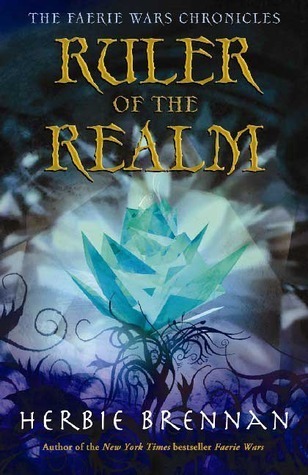 Overall, I really enjoyed Ruler of the Realm and can't fathom what's may occur in the next book. This is just one series that gets better and better as it goes along. I'm going to be very sad to reach the end of it. I care about the world, I care about the characters. It keeps me guessing all the time. This is a series I love and would reread every year. The plot constantly kept me on my toes. I greatly enjoyed it. Action-packed and fast-paced. I could barely set it down. After the Purple Emperor, Pyrgus Malvae's father is laid to rest, and his younger sister, Holly Blue, is given the throne, Lord Hairstreak finally suggests a truce. The ever-brimming civil war between the Faeries of Night and Faeries of Light might finally come to an end. Yet, Blue isn't sure she trusts her uncle's offer. Pyrgus has also found something strange growing in the Nighter capital, something that could threaten the Realm's existence. And Henry, poor Henry, is starting to doubt his sanity. I, on the other hand, was starting to question my patience with Herbie Brennan's Ruler of the Realm. This is when the series starts to get weird. Not only does it have faeries and demons, humans, and endlogs, but now it has aliens too!Also, in this book, I started to weary of Brennan's writing style. Each chapter ends with a cliffhanger for a character or two, and the next chapter starts with a completely different character and setting. At one point, I wanted to tear the chapters out and reorder them myself, but I couldn't, since it's the library's book, not mine. However, some of my favorite aspects of this series are still there. Henry's family life at home is always so rich in its honesty. Not only is Henry uncomfortable at his mom's (her mistress just moved in), but his dad decided to have a mistress too, one barely older than Henry. Brennan is also a master at plot twists. There's a part in the second half that had me gripping the book tightly, even though I was dead tired and my body was wanting to sleep. The ending, oh my word, the ending. Blue really shines, and I have to applaud Brennan for creating such a strong female protagonist. Sure, sometimes she gets into trouble, but she doesn't always need saving. It's really refreshing to see. Would I recommend this book? Hm. Well, like I said, it has a slow start, but as you get towards the second half, the story really picks up. That said, if you consider yourself a fan of the Faerie Wars series so far, then by all means, trudge through this installment. You won't regret it. If you've read Faerie Wars and The Purple Emperor, and you weren't particularly wowed, then Ruler of the Realm probably won't change your mind. I spotted FAERIE WARS at a yard sale and paid either .50 cents or a dollar for it. I thought the cover was really cool and the synopsis on the back sounded interesting.Once I got home and started to read it I noticed the next book was advertised in the back pages and that's when I remembered seeing the second book in this series at that same yard sale. So the next day, my husband and I drove over to that house - I just happened to catch the owner there and when I told her I'd bought the first book there the day before and thought I had seen the second book too and could I please buy it from her as well if she still had it?She showed me the boxes from the yard sale, I dug through and found THE PURPLE EMPEROR (book two) and the lady ended up giving it to me for free! yipee! !That was four and a half years ago and I have since read ALL the books in The Faerie Wars Chronicles at least once - some I've read 2 and 3 times. This book, THE RULER OF THE REALM, I read about three years ago. The books just keep on being awesome. I love these characters. The adventure and danger and world building is amazing. I get completely transported while reading these books.It's been long enough since I've read them that I don't remember exactly how each book in the series went. But the next time I read them (and I'm sure there'll be a next time) I'll try to remember to come back here and review each one again as I go. :)Meanwhile, I love these books! This is my absolute, all time favorite series. I love them. I want to read them again right now - they are so good. I'd want to bring the entire series with me to a deserted island. I don't love them so much I want to marry them - basically that would be ridiculous because I'm already married (and also, these are books) ... but honestly, I was really happy my husband read the series and he liked it too - so I know I will always have someone who understands and appreciates my squealy-girl fandom when it comes to The Faerie Wars Chronicles. I wholeheartedly recommend The Faerie Wars Chronicles to everyone. Especially anyone who loves fantasy, faeries, otherworlds, young adult, young love, adventures and awesomeness in general. ages 13 and up. I truly hope you love them as much as I do. Queen Holly Blue knows that the fate of the Faerie Realm is at stake, and it is up to her to declare war on the Faeries of the Night. Much to her sunrise she receives word of a non-aggression treaty proposed by their leader, her Uncle, but can she trust him.Meanwhile Henry Atherton is still at home in the human world dealing with his mother’s new girlfriend and interrupts his father’s very young girlfriend when emerging from the shower. He is obviously under a lot of stress and assumes that he imagined a stress related fantasy of a realm of faerie. After a three day disappearance, which leaves is memory blank except for a flying saucer and little green men, Henry is suddenly transported back into the Fearie Realm. And he is reminded it isn’t a fantasy at all.On her visit to verify the intentions of the Faerie of the Night, Blue is kidnapped by Henry. It seems that the little green men weren’t a figment of his imagination but a guise for the Demons of the Faerie Realm so that they could use Henry to get the Blue. It seems that they are plotting their own takeover!Ruler of the Realm is the third book in The Faerie Wars Chronicles. The first book is Faerie Wars and the second is The Purple Emperor. Both are fantastic books! I don’t think my lousy summary does this book any justice, I mean little green men? But there is much more too it than that, and it totally plays nicely into the story! So, don’t let that stop you. This book and series isa combination of magic, futuristic technologies everyday realism, plus adventure and excitement! The plot is completely enthralling and unpredictable, right down to the climax! This is an awesome fantasy series! I can't wait to read the next book, Faerie Lord! I've been doing a reading challenge http://bit.ly/tenbookread and been updating my progress as I go along. So here are my thoughts at different stages in the book.Page 21: Got this set of books for Christmas a few years back. Been enjoying them immensely ever since. In my honest opinion one of the best/if not the best real world/fairy world crossover books ever. Being YA novels Herbie Brennan has spared none of the gory details and tries to gross you out at almost every turn. And being books full of magic/strange creatures he has done a fine job of keeping it realistic. Being the third book it is hard to say much with out spoilers. So I will say it is on par with the rest of the books and bound to make me want to read morePage 190: Maybe the first two books were too good, but this book doesn't seemed to have grabbed my attention as much as the first two did. Although it's still great to see what the characters are up to and how they're adapting to their new roles. Still a lot of book to go so plenty of time for things to improve. That being said it's still a great book and well worth reading. Page 341: Things have turned for the better. The story has picked up has captured my attention again. The characters of the book are facing their biggest challenge yet, and it will be interesting to see how it will pan out!Page 429 (completed): I think the the last 70 or so page really made up for the middle part of the book. There were a lot of twists and turns and I saw sides of the characters that I hadn't seen before. And I suspect the last book in the series will be even better. Overall I think these books should become classics in their own right. Usually books suffer from the sophmore slump. Unfortunately, the Faerie Chronicles is terminally cursed when it comes to the third book. Was this even written by the same author? It was horrible. Awful. I want my hours back!I have a few major pet peeves when it comes to books. A major one is authors forgetting their own story and contradicting themselves. There were some major holes in Ruler of the Realm. The first was the fact Henry suddenly looks normal ... and yet when The Purple Emperor closed he had technicolor hands and a rainbow chest. Nothing about that in this book. Now beyond that add in a plot that stumbles slowly along trying to be interesting but failing miserably. The whole alien/demon thing? Yeah, we get it. Way over done. The characters were acting out of character in many instances and there were several times I just wanted to reach into the book and smack them becuase they were being so stupid. Colossaly stupid. Improbably stupid. I stopped reading/listening 2/3 of the way through the book. I just couldn't make myself finish and I didn't care enough about the story.I listened to the Audiobook version of this book. They switched narrators from the second book and the third also suffers for that. The new narrator doesn't have half the vocal range of Gerard Doyle, and he commits the further sin of mis-pronouncing half the names. Most annoying. This book is a great continuation of the Faerie Wars Chronicles, and a very good read in general. In the story, things seem to have quieted down in the Faerie Realm, but everyone knows tensions have never been higher. Queen Blue is considering going to war with the Faeries of the Night- even asking an oracle what the outcome would be, but getting a confusing answer - and has left to negotiate peace with Lord Hairstreak, issuing orders to attack if she does not call them off within three days. But then Blue is kidnapped - not by Hairstreak, but by the last person anyone would expect.The suspense that made the first book impossible to put down is still present from chapter to chapter, but it is also combined by the looming presence of war on the horizon, and the questions of both sides as they scramble to figure out who is the enemy and what they are planning.However, the first book in the series was by far the best. Some spark that was caught by "Faerie Wars" just was not replicated in "Ruler of the Realm", and this one has another "PG-13" scene that (SPOILER) doesn't really happen. (That sounds hard to understand - trust me, it is).But all and all, Ruler of the Realm is a great story for teens who enjoyed Faerie Wars, but don't expect it to be amazingly better. Faerie Wars was an all-around great book. Purple Emperor wasn't quite as good, but I still liked it. This one...I would classify most of the plot of this one as weird. It was still interesting, and it was actually REALLY good at the very end, but there were a few places where I felt like I was plodding through.However, I did really enjoy some of the character growth. I'm getting kind of annoyed at the Henry-Blue relationship, and wish that Brennan would do something already. This book didn't finish it, but made some progress. I also really liked the way the plot came together, but it did start out slow.If you liked the way the first one was structured, this one is better than Purple Emperor, but still not as good as Faerie Wars. I'm hoping Brennan returns to his original structuring for Faerie Lord.So I would Recommend it, but not highly recommend. While the Faerie Wars Chronicles are labelled YA, I find them extremely fun to read. Book Three is just as fast pace as the other two and all the old familiar characters are back. The Faeries of the Light and the Faeries of the Night seem destined to go to war yet again, Lord Hairstreak plotting, taking out rivals. Queen Blue with the aid of Madame Cardui, Gatekeeper Fogarty and her wayward brother, Pyrgus seek a peaceful solution but Henry comes back to their world from the Anaglogue world and kidnaps Blue. An old custom, a Countdown had been put in place and there is no reversing it without Queen Blue. When demons start gathering in the wasteland outside Yammeth City, all hope seems to be fading.The story has a little bit of everything, Faeries, teen angst in this world, demons, vampires, magic, crystal flowers, hell, spies, alien abduction and oracles. I still have to read books 4 and 5. This is the third book of this series and its about the light and dark faeries trying to make an alliance to prevent the prince of hael (their version of hell) from gaining control of the world including our world. So This boy from the analogue world (Earth) goes to their realm to help out Blue, the Faerie Queen of the light, also the one he secretly loves. Together they have to stop the Prince of Hael from taking over the realms so Blue's uncle is part of the faerie of the dark and so they unite to try to stop the Prince of Hael. There's alot of brainwashing and intense drama happening in this story. In the end Blue saves them all by killing the Prince of Hael and thus she becomes the Queen of Hael and faerie with an alliance with the dark faeries, because the prince tried to hurt Henry and she loves Henry.You learn that love can overcome everything and that with love you can continue to keep fighting for what you believe is right. Yes! We can move forward two steps and back three and still end up going forward! :) Pyrgus secret is out and Blue is now the Empress.. but how is poor Henry going to cope with being in love with the ruler? Has he even got the guts to tell her? The story advances with Hairstreak (that name STILL cracks me up every time I hear it!) mounting a revolution agains the faeries of the Light by the Faeries of the Dark. Can he actually defeat the FOL? Will Beleth be able to overcome the closing of "hell" and invade the Realm... will Pyrgus keep trying to impress Nymph in vain or will he just kiss her? The exciting story continues....Much better writing by the author as it goes from character driven - with as many stories as characters - to stoy driven - with a few major stories that involve multple characters. Faerie of the Light Queen Holly Blue, her brother Pyrgus, Gatemaster Fogarty, and the Painted Lady find their world shifting and tilting dangerously towards war. Henry, having been abducted by demons and subsequently working for them kidnaps Blue. Pyrgus leaps at the chance to do reconnaissance work, in his usual bumbling manner. Meanwhile the former bank robber and mechanical genius from the "Analogue World," Fogarty, has assumed the robes of the Purple Emperor until Blue is returned. The action is fast and furious as the faeries of the light find themselves in a war first with Lord Hairstreak and his faeries of the night and then confronting the demons.Brennan's humor is similar to Pratchett's and the series reminds me of Pratchett's Tifanny Aching books. This third book in the Faerie Wars Chronicles finds Holly Blue ruling the Faerie Realm and receiving a suspicious offer of peace from her uncle, the evil Lord Hairstreak, and the Faeries of the Night while Henry is facing his parents' separate new romances in the "real world." Holly sets out on an action-filled quest to discover the truth behind the offer that leads to kidnapping, betrayal, romance, and danger. Readers who enjoyed the first two books will not be disappointed as Brennan brings this cross-genre fantasy-science fiction trilogy to a satisfying close, but the work is a bit confusing as a stand-alone read. While I found this third in the series a little less confident in terms of pacing and somewhat unsure of where it was going, it still was a great deal of fun and proved an ideal audio book companion for driving in my car. The short chapter format suited this well.I was also a little thrown off by the change in narrators from Gerald Doyle to James Daniel Wilson, especially as he decided to pronounce Prince Pyrgus' name differently to Doyle, which bugged me to no end for a while. Still, he had a wide range of character voices, which he used to good effect especially the humorous ones. He obviously had great fun with the reading and that was infectious..
well Henry is back at his realm and has to deal with his mom's Girlfriend (lez) but he is ported back to faerie world. This is when Blue is kidnapped by henry because the demons are using him. The light Faeries' are frighting with the night faerie's which is under Hairstreak control. This book series is my first book that has to do with different realms. This book does not remind me of any other book because i have never read anything like this. The chapters are very short so it changes from character to character fast. The book has a lot of characters so it's hard to remember them all. If you are going to change the person who is reading your audio books, maybe you should have them listen to the first two so they don't change one of the lead characters names so drastically and horribly it takes half the audio book to stop shuddering every time you hear it. That being said, except for a few minor glitches, I really liked this one. Still have the whole Mom is a Lesbian thing that I could do without as it has nothing to do with the real story, but loved everything in the Realm. Romances are starting to bud a little more in this and it is about time. Sapete, questo volume della saga sulla Guerra degli Elfi è abbastanza incasinato.Brennan sta perdendo il tocco... il primo era così bello e divertente... invece Il regno in pericolo sta cominciando a diventare inverosimile. Non che sia brutto, però la costruzione della vicenda è troppo complessa e ingarbugliata perché uno riesca a seguirla linearmente come era successo per i capitoli precedenti.E poi lo catalogano come libro "6-10 anni". A me non pare proprio! The third book in its series, I simply loved it. It had me guessing to the last minute and held a few great surprises up its sleeve. The series is about two normal humans, a young boy and an old man who end up getting entangled in an alternate world of faeries, where Night and Light faeries feud constantly. There's some romance, some intrigue and a lot of demons, faeries, and fighting. The fourth one comes out in December and I'm much looking forward to it. This series rules... I want an endlog for a pet. Would make my life wonderful. I'd finally know if people were truly being honest with me or not. I love Blue - she's bloody brilliant.Poor Henry and his wack-a-doo mother, father and sister.Also... go feral Faeries, Fogarty and Madame Cardui.Love, love, love this.Shout out to her excellency JESSICA DAY GEORGE (it's always in caps when I say it in my head too) for highly recommending this series. Third in the young adult series Faerie Wars Chronicle. Henry, after having been back in the normal world for a while, has begun to question whether his time in Faerie was real or not, or perhaps just his mind dealing with stress of his parents' separation -- only for him to promptly to be abducted by aliens/demons. The Faerie of Night are offering a peace treaty, but Queen Blue is suspicious. Much in the same vein as the first two novels, but still enjoyable. Herbie Brennan - What you should knowName: Herbie BrennanOccupation: AuthorFavourite book: The Crimson Petal and the White, by Michel Faber.Favourite subjects: Esoteric matters, psychical research, anomalies, Mac computers, other people and cats.Favourite journals: Journal of the Society for Psychical Research, Mac Format.Favourite holiday spot: Kenmare, County Kerry, Ireland.Number of books published: 108.Total copies sold worldwide: 7.5 million +.Herbie Brennan recently (written 2007, excerpt taken from The Restless Dead) celebrated publication of his 104th book, The Purple Emperor, a sequel to New York Times bestseller, Faerie Wars. A longtime student of sorcery, he discovered an old copy of the Lemegeton, or the Lesser Key of Solomon (a book that really does exist) in a junk shop and used it to conjure up "The Necromancers." The magical techniques described in the story are authentic, but cautiously edited to protect the reader.